You heard me darn it!!! I’ll fight and scream and kick and wail loudly if any tells me that it is time to stop using pumpkin in my cooking because Autumn is over. Give me Pumpkin or give me death. Ok, just give me more pumpkin. Seriously though, I’ve mentioned before that I’ve never been one to cook by the seasons. I mean sure, we have more salads, fruits and veggies and grilled foods in the warmer months but that’s not because it’s trendy and seasonal (have I mentioned that rebellious I hate being a conformist thing?) but because it’s the only time of the year we can afford decent fresh produce and because there are constant sales on meat. That being said, I admit it; I make pumpkin cranberry bread in the middle of Summer as well as roast turkeys then (I have a slight turkey addiction) and I have been sighted like Bigfoot, grilling in January (hmmm; do you tihnk Bigfoot grills out?). I don’t know… it’s just always seemed silly to me to give up the foods I love because according to tradition, you don’t cook certain things when it’s cold or others when it’s hot. Mind you, I also admit that I can’t bring myself to make, say, a pecan pie unless it’s the holidays. Somehow that one seems meant for the holidays and ONLY the holidays. Annies Eats . I think I’ve mentioned before that I absolutely love her blog. This lady has two kids, is also a doctor yet still finds time to keep up with a well written food blog and make things that leave me drooling. She puts me to shame. I haven’t changed the original recipe a whole lot though I named them differently (seems only polite) and differed on a few ingredients as well as method. I’m sure her’s were a thousand times better but what is a recipe for but to put ones own style on it? No matter what though, I think you’ll love these. They are sweet and not overly spiced and are even better the next day. They’re a perfect breakfast or dessert muffin. For the filling- Combine the cream cheese,powdered sugar, cinnamon and vanilla extract in a medium bowl and mix until smooth. Set aside while you make the muffins. Make your topping- In a small bowl, using a pastry cutter or fork, combine the topping ingredients until it resembles coarse crumbs. Set in the fridge until ready to use. Preheat oven to 350 degrees. Either grease 24 muffin cups or line them with paper or foil liners. In a medium bowl, combine your dry ingredients (flour through baking soda) and mix well. In a large bowl combine the remainder of the muffin ingredients (eggs through pumpkin). Mix well on medium speed. Dump your dry ingredients into the pumpkin mixture and mix at low speed, just until combined. Remember; never over beat muffins or quick bread. You’ll get tough muffins with a lot of tunnels through them.. Fill each muffin cup with just enough batter to cover the bottom. Then Then top each cup with a small spoonful of the cheesecake mixture. Fill the muffin cups with the rest of the batter. I ended up with 24 muffins and two mini loaves. Sprinkle each muffin with a small amount of the streusel topping. Bake at 350 degrees until golden brown and the tops don’t look moist, about 25 to 30 minutes. Turn out onto a rack to cool. This entry was posted in Breakfast, Easy, Muffins, Pumpkin, Snacks and Appetizers, Sweet Baked Goods and tagged easy, muffins, pumpkin by Janet. Bookmark the permalink. I am with so with you – I even eat pumpkin pie in the summer! 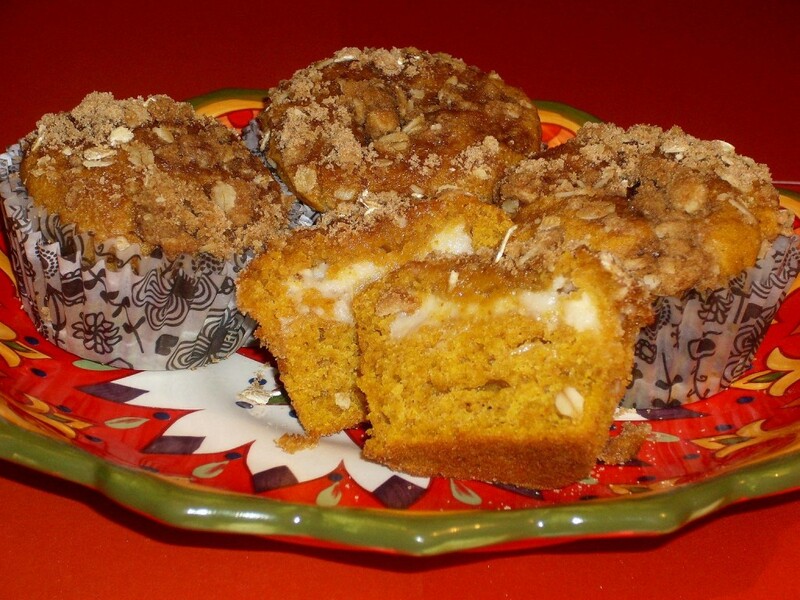 LOVE these muffins…anything pumpkin AND cream cheese is wonderful. Oh heck, you’re not alone with this whole pumpkin thing. I’m still making pies and probably will all year. I love, adore and constantly crave pumpkin pie. That being said, cheesecake is my next biggest addiction. Look at you tucking number two right inside number one like that. I’m hooked already. Yes, since I am ready to celebrate Christmas and New Years all over again, I am glad to see this pumpkin recipe now. Actually, my door is open to accept these tasty gems anytime. I see that doing step 7 and 8 will make me impatient to let cool as stated. Yummy post! wow I love muffin and with cream cheese my eyes are rolling…I know it taste really really great. I know I will have to make them asap! In Australia the only way we have pumpkin in roasted or as pumpkin soup. We ever make desserts from vegetables??? Yum! I love muffins with cream cheese, wishing I had couple of your muffins now. Your muffins and a cup of coffee would be perfect now. Your pumpkin muffins look perfect. I think that it is okay to bake with pumpkin year round. I love pumpkin and use it all the time. I dunno, Janet – it looks pretty good even though fall is over. If you like it – make it! I am with you, I am not ready to give up on Pumpkin! It should be a flavor 100% of the year. These look amazing!!! I could definitely eat pumpkin all year! These muffins are fantastic!! I’m with you! I like pumpkin WAY too much to limit it’s use to fall! Loveeeee your recipe, very very tasty!!! thanks for sharing and have a lovely day sweetie!!! Definitely don’t stop using pumpkin, particularly if the baked goods are this wonderful!